Fisherman runs to the rod and grabs it, but fish escapes. 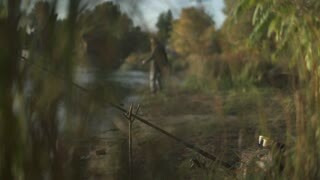 Bearded man is fishing on the river bank. 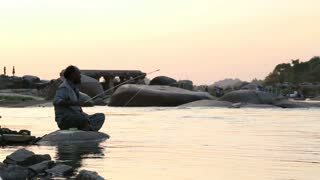 HAMPI, INDIA - 28 JANUARY 2015: Man sitting on rock at the riverbank and catching fish with rod. 1930s: UNITED STATES: man catches fish on rod. Rod bends with weight of fish. Fish flops in water. Dog watches fish on line. 1930s: UNITED STATES: fisherman catches fish on rod. Fish pulls hard against man. Man battles with fish on line. Fisherman on the pond. 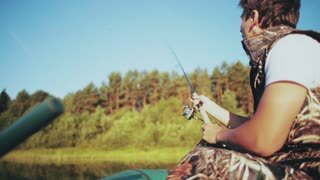 A young guy with dreads in glasses in a t-shirt fishing fish rod. 1940's: Man fishes with rod and reel from back of fishing boat; fisherman assists in hauling in catch; fish flaps on line. 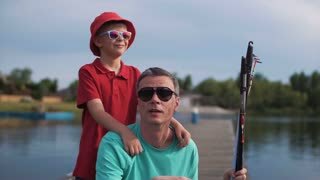 Fishing with spinning tackle on wooden pier. 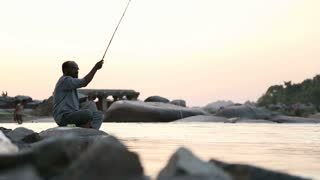 Fisherman cast fishing rod in lake or river water. Man fishing and holds angling rod. Man fisherman catches a fish. Angler fisherman trolling rod. 1940's: Freshly caught fish laid out on dock; men examine wagon full of fresh fish; man in raincoat fishes with rod off back of boat. Fisherman throws a fishing tackle into the lake from a wooden pier. 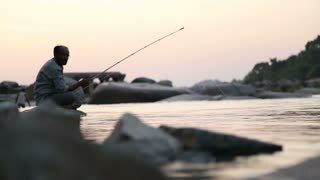 Fishing in river. Man fisherman catches a fish. Fisherman with spinning rod catching fish on lake. 1940's: Blonde woman works at reeling in fish with large rod and reel, fisherman hauls in large fish; elderly man works fishing rod. UNITED STATES 1960s:Boy Pulls in Fish on Rod. Boy Dismantles Fishing Rod by River. 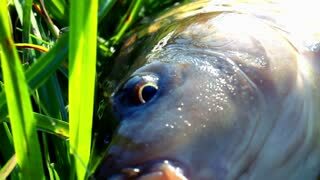 Fishing for Arapaima gigas fish with rod. BENTOTA. SRI LANKA - APR 28: Man in small wooden boat fishes with rod on Apr 28. 2013 in Bentota. Sri Lanka. Fishing is traditional occupation in Sri Lanka. 1940's: Man fishes off back of boat with rod and reel; large fish lies on bottom of boat; boat speeds over water, leaving wake.